1. I need a new roof !!!! Looking to get a replacement softtop, with or without frame, but ideally without the holes / splits that the current one has. Also it would awesome if there is someone who is forum trusted to fit it. 4. Would love to hear from anyone who might have done a long tour in an older car around sensible spares to take or issues that are more likely than not to arise. WOW, longer first intro post than I thought but hey i was on a roll. Hello and welcome, we had a Scooby in at my work the other year that was covered in fur and driven abroad to raise money for charity. They left it in the last country for any one to take. Good luck. BoabG wrote: Hello and welcome, we had a Scooby in at my work the other year that was covered in fur and driven abroad to raise money for charity. They left it in the last country for any one to take. Good luck. Welcome to the forum Regan. There is no parts fische but you should get a parts pdf off the internet with the various diagrams and part numbers. I cannot remeber where I have seen one but google is your friend. Can't help with a hood. The following secondhand bits would be handy after they were tested as working. Alternator and power steering belt. Prior to going a full service and new cambelt and water pump. Welcome to the forum - hopefully you will get some useful replies - I suggest you take plenty of sun cream and a waterproof if you don't get a new roof!!! drumtochty wrote: Welcome to the forum Regan. Thanks a lot, this is exactly the kind of info I was hoping for. already got a workshop manual ordered, im not the greatest with a set of tools but there will be a few guys that are going who are so fingers crossed. Delighted to see an old Mk1 doing an H4H gig. A Mk1 is perfectly capable of taking it's passengers long hauls in comfort. No worries. Many folk "Do France" regularily in Mk1s...and any other "Young Pretenders"
Mine did..and will be again soon. This old feller did 2000 hard miles in 6 days, and needed a light bulb. Radiator..it was going leaky anyway. Leads, plugs, ( NGK Long Reach) K&N filter pad. Top & bottom hoses..and the pesky heater hoses that go into the bulkhead. Brake pads, and replaced the discs..cheaper than you might think. Changed out trans oil, and diff. Cleaned all earth wires, and checked out the loom contacts throughout. New wiper blades, bought a full bulb kit. What is most likely to stop you on an older Mk1 doing a long hard haul? It's all about how much you want to spend against how much risk you want to take. Just noticed Eddie's post..sorry for double up on some things. I'm just 20 mins from you so if you want me to glace over the car I'd be quite happy. Are you planning to bring the car home again ? That will dictate how much you are prepared to spend on your roof etc. Take a drive down to upullit in inverkeithing and see if they have any breakers in - a roof on frame should set you back around £60-£80 should take around an hour to remove, the same to refit. if you want a new roof, try moss-europe.co.uk who have some of the cheapest options available, DIY fitting is straightforward but I wouldn't want to do it at this time of year without a garage / workshop . Secondly and most importantly I want to spread the word about how absolutely awesome Steve Bloxham is from GoodWood Sports cars. 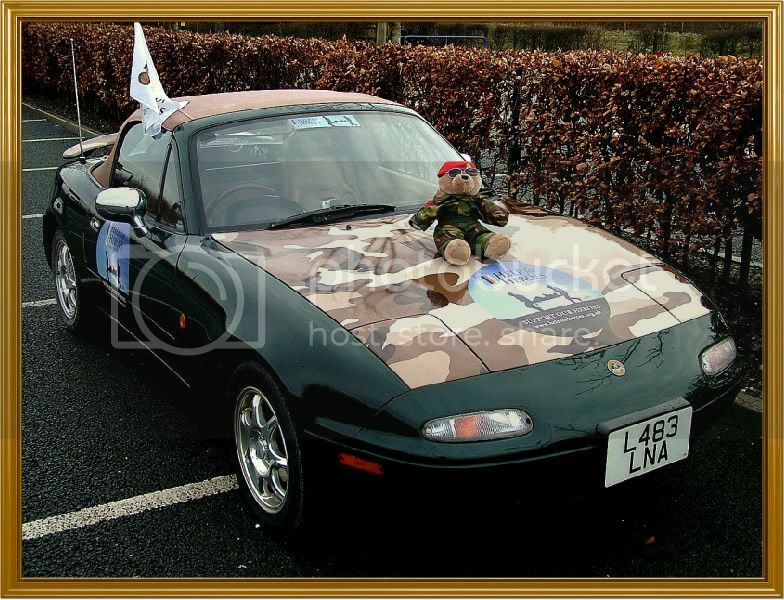 So guys and gals alike, if you ever need a roof fitted or are looking for a replacement MX-5 you simply must speak to or just go straight to Steve. We cant thank him enough. And if anyone happens to be interested in taking a look at the before and afters and general progress pics as we get ready for Rome then drop on over to Facebook and look for "Rust 2 Rome - The Dirty Martinis"